The sold out 2018 National Conference on Ending Homelessness will welcome 1,300 participants to Hamilton Nov. 5-7. In this guest video blog, Cole Gately from Core Collaborative Learning talks about the power of film ahead of the Canadian Homelessness Film Festival happening alongside the conference. The Canadian Homelessness Film Festival on November 4th and 6th will feature short films created by people with lived experience as well as front line workers, panel discussions, feature films and much more. The festival is being put on by Core Collaborative Learning, which is a program of Good Shepherd Hamilton that brings in-person workshops and online courses to front line workers serving in the homelessness sector. The festival is happening at the Lincoln Alexander Centre (160 King St East, Hamilton, ON) starting at 5 p.m. on November 4th and then 6 p.m. on November 6th. Cole Gately, education coordinator with the group, is organizing the festival and wanted to share his video blog about the power of film. Watch below. Cole will also be presenting a workshop at the National Conference on Ending Homelessness on Nov. 5 called Trans Inclusion in Housing and Homelessness Systems. This interactive workshop will use discussion, video and presentation by two trans educators with diverse lived experience of being trans and gender non-conforming in Canada today. We will examine terminology as a group, focusing on newer and less familiar concepts. Participants will be introduced to Canadian research statistics around trans experiences in housing, homelessness, health care and the community. Acknowledging that there will be lived expertise in the room, learners will discuss and share emerging best practices on trans inclusion in a diversity of settings across Canada. The National Conference on Ending Homelessness is featuring over 200 local and global experts, as well as powerful keynote speakers. 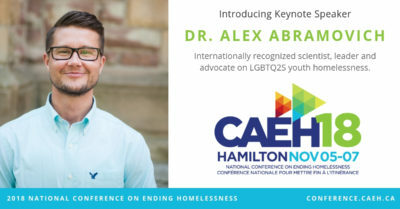 One of those speakers will be Dr. Alex Abramovich, an internationally recognized advocate on LGBTQ2S youth homelessness. While the conference has sold out, if you’d like to be put on our waiting you can email: caeh@goldenplanners.ca. We’ll also be live streaming our keynote speakers and candid interviews on our Facebook page. What could an outcomes-based Reaching Home look like?